SAN DIEGO – November 19, 2014 – The Rock ‘n’ Roll Marathon Series today unveiled #MyRnRTour, a new interactive race-calendar planning tool for the 2015 Tour Schedule that officially launches on Thursday, November 20 with a special one-day registration promotion. With #MyRnRTour, runners compile the races they plan or hope to run in 2015 into one customized running calendar for the year and commit to run by registering with series-wide savings for 24-hours. Once a 2015 race calendar is created, participants can share it on social media and encourage their friends to run with them. Runners around the world have already taken to the #MyRnRTour tool, and created customized calendars to share with their fans and followers. Many races will open registration for the one-day promotion on Thursday and will close on Friday until a later re-opening date. 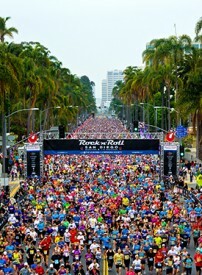 To register with some of the lowest prices of the series, sign up online at RunRocknRoll.com. Participants will have two new destinations to choose from next year, with the launch of Rock ‘n’ Roll Mexico City Half Marathon and Rock ‘n’ Roll Brooklyn Half Marathon. This will be the first time the race series will debut in Mexico, with a night race taking place on Sunday, March 15, 2015. Rock ‘n’ Roll will also return to New York in October 2015 with a new half-marathon in Brooklyn. The series includes 23 destinations in North America featuring scenic routes that showcase world-renowned attractions including the National Mall in Washington D.C., Golden Gate Bridge in San Francisco and the Las Vegas Strip at night, among others. The 2015 tour also features four European stunningly scenic cities including Madrid, Liverpool, Dublin and Lisbon. The Rock ‘n’ Roll Marathon Series started as a single race in 1998 and is now the World’s Largest Running Series that has grown to include more than 600,000 runners taking part in a global tour of 29 events in 2015. Organized by Competitor Group, the series was the first to combine a road race, tourist destination, recreational running, charity fundraising and musical entertainment into a single event that celebrates health and wellness. The events have become a fundraising powerhouse for charities that have developed endurance-training programs, such as the Leukemia & Lymphoma Society, St. Jude Children’s Research Hospital, the ASPCA and Crohn’s & Colitis Foundation of America. Since the Series started in 1998, charities have collectively raised funds in excess of $305 million (net) through the events. Organized by Competitor Group, the Rock ‘n’ Roll Marathon Series annually welcomes more than 600,000 professional and amateur runners taking part in 29 events around the world. The series, which started in 1998 with the simple idea of making running fun, has transformed the U.S. running landscape by infusing the course with live bands, cheer teams and entertaining water stations, creating a block-party atmosphere for participants and spectators alike. Race weekend kicks off with a free Health & Fitness Expo showcasing the latest in running gear, sports apparel, health and nutritional information and much more. Events culminate with an entertaining finish line festival featuring some of the biggest names in music, with headliners like Pitbull, FloRida, Cheap Trick, Bret Michaels and Macklemore. Rock ‘n’ Roll Tour Pass offers runners access to run multiple races for one-low price and earn Heavy Medal bling by completing more than one race in a calendar year. For more information, please visit RunRocknRoll.comor follow @RunRocknRollon Twitter.